Great timing! The heat is behind you, the frost is well ahead of you, and the roots have time to establish before the ground freezes. Pests and disease problems also fade away in the fall. When an otherwise good plant begins to under-perform, either from competing plants, inadequate light conditions, or its mature roots need to be divided, sometimes a change of address is the cure. Or perhaps you just want a fresh look in your garden! Come fall, most plants and trees are entering a period of dormancy. Rather than continuing to transfer energy into new foliage and above ground growth, plants are now transferring energy into their roots and storing nutrients and resources for the cool months ahead. Among the best candidates for transplanting are those ready to be divided. Here are some quick tips on how to divide different kinds of plants. To divide rhizomes, dig them up and rinse off any excess dirt. Break or cut the rhizomes apart. If there's still any greenery on the rhizomes, make sure each one has one or two stems when you divide them. Then just trim back the foliage and replant. 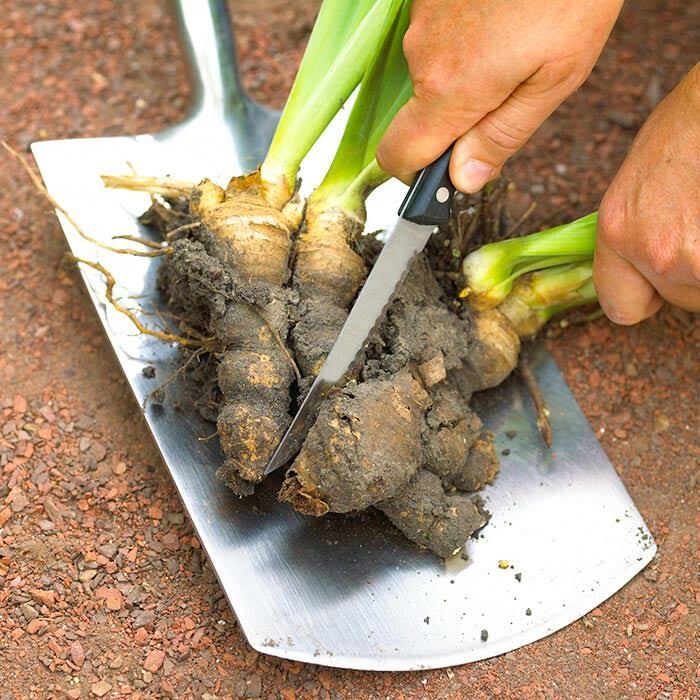 If you have a big clump of bulbs, gently dig it out then just pull the individual bulbs apart. Discard any soft, damaged or dried out bulbs and replant the healthy ones immediately. Lily bulbs have outer scales that can be removed and replanted individually. For other plants, simply dig up the whole plant and use a shovel to gently divide the root systems. Optimum time for fall transplants is 4-6 weeks before the first frost. In Zone 5, the first frost is typically around November 1. While most plants can be moved at any time without calamity—if one follows through with proper care—preferred timing based on blooming cycles gives your plants maximum advantage. • Spring bloomers can be divided and transplanted in fall, several weeks after blooming. • Late summer/fall bloomers can be divided and transplanted in early spring, before budding. While you may be tempted by sale prices, don’t plant or divide ornamental grasses in the fall. They have expended their stored energy by late summer and cannot grow new roots if planted in the autumn. Consider the new location first. In addition to aesthetics, think about light (sun, shade, part shade), soil conditions (pH, moisture, composition), expected size at maturity (width, height, scale, root depth, width), and weather exposure. Most plants you would normally prune or deadhead can be cut down to 6 – 8 inches tall before dividing or transplanting. This frees up the roots to work on strengthening themselves rather than servicing the upper foliage. Remove most of the foliage to reduce demand on the roots to supply water to the plant. If the plant has done well in its current soil, bring it along! There is interesting new research about plant roots and how they (essentially) sense and communicate within soil (fungi is also involved). Plants like familiar soil and transplants are most successful when minimal new soil is introduced around the roots. The exception would be, of course, if the previous soil was problematic or it’s a bare root transfer. Using a garden fork or narrow shovel, dig around the entire clump of the plant you wish to transplant, then lift the plant, soil and all, from the hole. The aim is to get all the roots and cause minimal damage. Keep newly dug and/or divided plants covered and protected from wind and sun, and transplant them ASAP to their new home. The new planting hole should be 1.5 times as deep and wide as the incoming plant’s roots. If you still amend your soil with compost and some aged manure, as I do, place transplants in their new environment at or slightly above the surrounding soil level. Newly disturbed soil has a tendency to settle and plants growing below grade can easily succumb to root rot or disease. Not only does water provide needed moisture, but it helps eliminate air pockets that could otherwise result in dead roots or worse. Keep the plant consistently moist until a hard freeze. Don’t bother with fertilizer as it will only encourage top growth, which takes energy away from the roots.